Submitted by peter on 21 December, 2006 - 13:21. According to study results issued by JD Power Asia Pacific, the quality of new cars manufactured in Thailand has risen for the third year running. Thailand Initial Quality Study 2006, asked 3,413 owners to rate the quality of new vehicles they purchased between January and July. The study measures 135 problem areas within 9 major categories: ride, handling and braking; features and controls; seats; heating, ventilation and cooling; sound system; vehicle exterior; vehicle interior; engine; and transmission. The performance for vehicles is then rated in terms of problems experienced per 100 vehicles, with lower scores indicating higher quality levels. The study included 49 different vehicles from 10 manufacturers. The results show that quality has improved again in 2006, as it has done each year since 2003. For 2006 the industry average was 216 problems per 100 vehicles (PP100), a 14% improvement from 2003. I don't expect anyone to be too surprised at the news that Toyota came out on top in all five award segments. The small passenger-car segment top 3 were: Toyota Yaris, Honda Jazz and Honda City ZX. The mid-sized passenger car segment saw Toyota Corolla Altis registering the fewest problems, followed by Mitsubishi Lancer and Honda Civic. Pickup trucks represent the remaining segments, with one for each cab size. Single-cab pickup segment winner was of course Toyota Hilux Vigo, Nissan Frontier second, and Mitsubishi Triton third. Extended-cab pickup segment again had Toyota on top with the Hilux Vigo Prerunner ranked highest, Mazda BT-50 second and Nissan Frontier third. 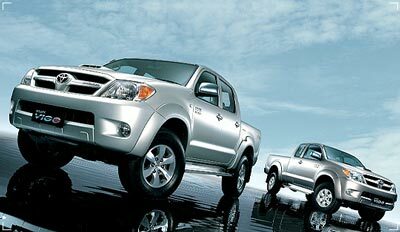 Finally in the double-cab segment Toyota Vigo was again on top, but Chevrolet Colorado and Isuzu D-Max Cab-4 move into second and third respectively. So it seems that despite some popular opinion that Toyota trucks were dropping in standard over the last few years, this study would suggest otherwise. Remember that this study is only for cars between 2 and 6 months old, although high initial quality usually bodes well for the future. Toyota Vigo is not so perfect that it can walk on water, despite the image above.